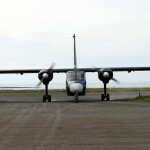 The Friday File: The shortest scheduled passenger flight is between the Orkney Islands of Westray and Papa Westray. The distance of the flight is 1.7 miles, and with a good tailwind can be flown in under a minute. The cost of the flight, $22.10. $13/mile is very pricey! The longest flight, 9,032 miles from Auckland, New Zealand to Doha, Qatar; flight time, 17.5 hours! In coach, it’ll seem like 100!